We were supposed to start to bring our emissions down globally at least two decades ago, but instead they have increased. Even though many groups like the Club of Rome are now calling for significant reduction of emissions by the 2020’s, it’s hard to imagine it happening by any stretch. Because we continue to fail to act in other ways to clean up our planet, geoengineering, which has been called a devil’s bargain, is becoming one of our only remaining options. Though it is certainly no substitute for cutting emissions. In this video lecture eminent climate scientist and polar explorer, Peter Wadhams, discusses the importance of geoengineering in a 4°C World with methods that are as benign as possible. Professor Wadhams has also explained that in many ways we are already geoengineering the planet unintentionally, which is why we are headed for a 4°C world in the first place. This is also referred to as the trend toward a Hothouse Earth. The Earth’s climate has become intertwined with the deadly, dirty emissions we have been releasing for decades. These pollutants littering the atmosphere are now arguably keeping us cool in terms of global dimming and other effects. We have become somewhat like addicts reliant on the supply of this dark habit. In order to gradually withdraw, measures like geoengineering are becoming increasingly necessary to explore. However, it is well known that this meddling with the planet poses enormous risks, and may well be a bit of the hair of the dog that bit us, as the saying goes. Many researchers are now reporting that it will likely be necessary to use some of these methods to assist the system to transition back to health and to slowly and gradually remediate the addiction. As stewards of this system, it will be incumbent upon us to choose natural, non-toxic methods that do not further damage this system which is already in jeopardy because of us. This is a very delicate and difficult situation to say the least. It is going to be very important to have a discussion regarding what the ethical implications of these measures are. Scientists will need to carefully weigh the risks and benefits as they move forward in experimenting with this technology. There will need to be sign-off from many levels. Many are also saying that geoengineering will not solve climate change, but may buy some time. Some forms of geoengineering, also known as a weather modification (not to be confused with chemtrail conspiracies 1) have a long, controversial history dating back to 1940’s when ‘weather as weapon’ campaigns were first sought by the military. This is the ugly side of this topic. It is known that the military has long held the power to make it rain, increase storms, seed clouds, cause mudslides, flooding, earthquakes, volcanoes and more. Operation Popeye for example, was used to create storms in Vietnam to route the enemy. In any case, most of the history of climate warfare is beyond the scope of this resource except as a cautionary tale for one and all. The extent of military weather modification programs is still largely unknown and unstudied by credible sources in the peer-reviewed literature. Therefore, the topic of climate warfare, its full history and its potential implications will not be discussed here2. This page is intended to provide an introduction to the topic of natural geoengineering as it pertains specifically to climate change remediation. In addition, the focus of it is upon mitigations that seek to work with, and not against nature, in the least invasive ways possible. These methods aim to restore nature’s own order and attempt to aid the planetary system to right itself as quickly as possible so that these mitigations would not be needed ongoing. Because of it’s sordid history, geoengineering is often a feared concept. But it doesn’t have to be. There is a new and separate area of this study now emerging referred to as green or natural geoengineering. It attempts to introduce protective measures that aim to to do no further harm by using non-toxic elements to reverse the destruction already done by man to nature. Not all forms of geoengineering are invasive and harmful. In fact, these types of natural geoengineering discussed here use bio-mimicry and natural methodologies. Geoengineering can be done safely working with naturally occurring elements and systems. There are many safe, natural, and non-toxic methods of geoengineering now being discussed. Most scientists and experts are now pushing in this direction. Natural, non-toxic measures like enhancing biodiversity to maximize the ability of ecosystems to store carbon are often overlooked tools in fighting climate change. Further discussion of these methods follows below. Not all geoengineering solutions are techno-fantasy or require high stakes risks with toxic components. Just planting a tree, or lot’s of them, is a form of geoengineering. It couldn’t be that simple right? Wrong. We are always coming back to this. This is yet another well-known, safe, all natural technology long touted as a solution, but still not getting enough large scale attention. Trees are known to produce natural aerosol particles which seed clouds and create cloud cover and rain. This could alleviate the aerosol masking effect (also called global dimming) gradually as we reduce emissions. Reforestation is always a good idea. Recent studies reveal that the findings from the several experiments show that trees release molecules that contribute to cloud seeding. According to these studies, it was thought that the pollutant Sulfuric acid is required for a particular cloud formation. Sulphur dioxide (SO2) dissolves in the water vapor in clouds to form form dilute sulphurous acid (H2SO3). But these studies are showing that aerosols can form and grow to the size needed to seed a cloud from the molecules naturally emitted by trees, without requiring Sulfuric acid. 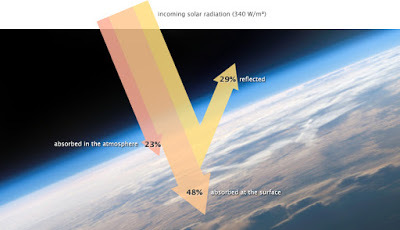 Solar radiation management (SRM), another form of geoengineering, is one method now being discussed that could also mitigate the widespread effects of pollution related to the aerosol masking effect. SRM has not been widely applied and it may require taking a risky gamble. SRM involves gradually eliminating pollution from factories, vehicles and other toxic sources; replacing it with artificial (natural, non-toxic) aerosols in the upper atmosphere where they’re much less likely to damage human health; and then praying nothing else goes wrong. Scientists at Harvard are planning “the earliest official geoengineering-related experiments conducted outside of a lab, with plans to test spraying a fine mist of materials such as non-toxic sulfur dioxide, or calcium carbonate into the stratosphere. The basic idea is that spraying certain types of particles into the stratosphere could reflect more heat back into space.“ The Gates Foundation is also involved in funding a similar experiment now. Scientists believe it could work, because it already occurs in nature. Large volcanic eruptions in the past have blasted tens of millions of tons of sulfur dioxide into the sky, which contributed to lower global temperatures in subsequent months. The historic Dalton minimum is one example of this. Climate Scientist, Paul Beckwith, discusses this in his recent blog Anthropogenic Arctic Volcano. It is known that stratospheric aerosols reduce the amount of direct sunlight that reaches the surface of Earth, but increase diffuse light. The side effects of this are as yet unknown. However, this may be our only chance now. The general principle behind the marine cloud brightening (MCB), another climate engineering technique, is that seeding marine clouds with concentrations of natural seawater particles might significantly enhance cloud albedo and longevity, thereby producing a cooling effect. Preliminary studies of the possible beneficial application would mitigate the recovery of polar ice loss, the weakening of developing hurricanes, and the elimination or reduction of coral bleaching. Many more ocean-based solutions and techniques are being discussed. According to Robert Tulip at Iron Salt Aerosol Australia Pty Ltd. “Iron Salt Aerosols are naturally occurring iron compounds, mainly iron chloride, that are main cooling agents in the earth’s atmosphere. Iron chloride removes carbon dioxide and other greenhouse gasses from the air, while also bringing extensive benefits for marine biology. Expanding ISA could be the single most economic, safe, easy and rapid contribution to reversing climate change.” ISA has numerous cooling effects. Iron Salt Aerosol (ISA) could provide rapid cooling to the oceans, methane removal and carbon dioxide removal (CRD). A small group of scientific researchers led by European chemical engineers Franz D. Oeste and Renaud K. de Richter, are studying this very strong, easily affordable solution to climate change that is unlike conventional climate solutions. Their solution is to rekindle a series of natural processes that operated powerfully during each of the ice ages of the past million years. This would be done by increasing levels of bio-available iron in the atmosphere, using a variety of methods including aircraft dispersion and through the exhaust flues of power stations, ships and remote, purpose-built dispersion platforms. The breakthrough discovery is of numerous inter-related cooling mechanisms involving naturally occurring Iron Salt Aerosol (ISA). It is known that yet another large factor in global dimming is the dimming that is produced by ocean pasture plankton. They also produce these aerosols. In fact, some researchers are now saying that diminished dust from collapsed ocean pastures and plankton cooling could be a force of nature far more powerful that CO2 radiative warming. Climate scientists often use the example of the Paleocene–Eocene Thermal Maximum (PETM), which occurred some 55 Myr ago to study and make comparisons about global warming and climate change. A study reported in Nature Geoscience, found that CO2 forcing alone is likely insufficient to explain this. They state, CO2 alone did not cause the PETM climate changes. The collapse of ocean productivity is also resulting in the greatest loss of ‘plankton cooling’ which some scientists are comparing with global dimming effects. Plankton cooling loss is readily reversed. Scientists showed this in the 2012 large scale Ocean Pasture Restoration Project (OPR) which restored 50,000km2 of ocean to health and abundance. While some scientists do not technically classify negative emissions technologies (NETs) as a form of geoengineering, others do. This topic is under debate. In any case, these technologies are worth noting in this discussion because they are also potentially natural and non-toxic methods that could reduce CO2 and get us back on track. They are sometimes called carbon engineering methods as well. According to Phys.org, many of the following “proposed NETs are highly speculative.” This article goes so far as to argue that these technologies won’t solve the problem. However, Bill Gates among others, is looking to experiment more thoroughly in the near future. Additionally, the regenerative abilities of the planet are still largely unknown. We have to find every way we can to give them a chance. Rewilding, reforestation, and similar natural solutions remain the ideal. If we can get out of the way of nature, stop polluting and employ some natural geoengineering strategies to aid this process we might find way out of this very real predicament that has us on course for the sixth mass extinction. Many are looking to projects like retrosuburbia, UNM, and other discussions of how to rewild the earth toward creating an ecological civilization with permaculture and sustainable development practices as well. These options would be much preferable to risky geoengineering options that are toxic or unnatural. As Greta Thunberg in Straight Talk (video) recently said, referring to the problem of climate change, that “the problem is already solved.” The only question is are we going to deploy the solutions in time? We have solutions. The real problem is we aren’t using them; and we may only have a short window to act. The situation is serious, even dire, but according to many scientists it is also solvable. While it would have been preferable to have left the geoengineering to Hollywood, at this point we might all have to be heroes. 1:00 pm Jan. 24, 2019 – Shani Cairns – (Added new history, references, and footnotes accordion menus and note on history of weather modification). 6:45 pm Jan. 14, 2018 – Shani Cairns – (Added topic Iron Salt Aerosol (ISA) and links to Robert Tulip’s website and content). 6:30 pm Dec. 31, 2018 – Charles Gregoire – (Completed a review, fixed some typos and changed to off-page links to open in new tabs in the browser). 10:45 pm Dec. 20, 2018 – Shani Cairns – (Added Geoengineering article content and associated “History” page with a brief introduction). The topics of geoengineering and weather modification must be separated from chemtrail conspiracy theories, another thing altogether. According to the Guardian on this topic,” an estimated 5% of Americans (…) believe that various global powers, including the US government, run clandestine and harmful chemical-spraying programs. ” This number has only grown since this report. If you want to learn more about chemtrail conspiracy theories you might start with this debate (video). “The first ever peer-reviewed study testing the chemtrails theory, conducted by researchers at the Carnegie Institution for Science in 2016. When asked if they’d ever uncovered possible evidence of a government chemtrail program in their research, 76 out of 77 leading atmospheric scientists and geochemists said NO. This controversial form of geoengineering has a sordid history, some of which is classified military information. A NASA article on Nuking the Skies discusses early attempts at geoengineering and testing in the atmosphere as well as the subsequent test bans by 1963 (which as a tangential, unrelated aside was not unfortunately soon enough to stop the testing of the 58 megaton monster Tsar Bomba in 1958, the radiation is now leaking into the sea from melting glaciers, an horrific result of the ignorance of this time). Significant test bans and laboratory safety measures have since been put in place around geoengineering research, not that they are always followed. Numerous questions remain surrounding the scale and extent of weather modification campaigns conducted by government and military agencies for the last 70 years. Note: This page, as with many wiki pages, is a work in progress and is far from complete. It’s aim is to introduce concepts in geoengineering, an increasingly necessary evil to mitigate climate change.